Emotional intelligence (EQ) has become a hot topic for business leaders in the last year or so. In my five years of working at Profiles, I’ve heard our President & CEO, Joe Gambino, mention the term numerous times, making him way ahead of the curve in this approach to business. 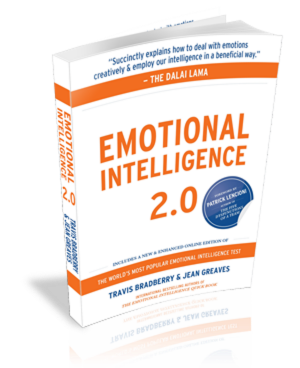 In August 2017, my mentor, staffing industry leader, Amy Bingham, suggest I read Emotional Intelligence 2.0 by Travis Bradberry and Jean Greaves. Along with the book, I received an EQ Appraisal code, which allowed me to take a quiz, evaluating my current EQ. I took the quiz and waited for my results with baited breath. I thought I would receive some quick scores with an explanation of who I am as a worker (a professional version of a magazine quiz). I was pleasantly surprised with the level of detail and completely customized results that the assessment delivered. Not only did it break down my work style, the simple assessment basically reached into my inner conscious. I had some hard truths to face but felt immediate relief and understanding (kind of odd simply coming from assessment results) after reading the suggested strategies to immediately begin improving. I dug into the book right away and was happy to learn that EQ is a skill that can be developed. My results honestly changed my life. I started to recognize my emotions as they were happening and was finding that I was better able to process them in real time. I didn’t become a new person, but I was becoming an improved version of myself. I found that my professional and personal relationships were growing positively as I was learning to identify my emotions at the moment. My communication with colleagues vastly changed, and I found myself collaborating more efficiently and effectively. I also saw major improvements in accountability, stress tolerance, decision-making, and assertiveness. I was getting real results from these small tweaks in my reactions to my emotions! Not only that, I was noticing other emotions and how they were positively and negatively affecting their interactions with me and our colleagues. After putting these strategies and lessons into place for a few months, I was itching to share Emotional Intelligence 2.0 with the rest of the team, with Joe as a huge supporter. At the Profiles 2018 Kickoff meeting, each employee received a book along with their own appraisal code. Shortly after distribution, the staff was instructed to take the quiz and forward over the results and everyone was given two months to read the book. The two months ended with a “book club-like” Lunch & Learn, where the staff was very receptive and heavily participated in the discussion. In the weeks following the Lunch & Learn, I am happy to report a continued application of emotional intelligence in our offices. From candidate and client communications to internal interactions, the book and its findings have been well-received, so much so that we have implemented the book and appraisal quiz into our training when onboarding new hires. 90% of top performers have high EQ. EQ is responsible for 58% of your job performance. People with high EQ make $29,000 more annually than their low EQ counterparts. *The link between EQ and earnings is so direct that every point increase in emotional intelligence adds $1,300 to an annual salary. This holds true for people in all industries, at all levels, in every region of the world. Have a strong motivation to learn or change. Seek feedback on their own behavior. Have I practiced my EQ strategies? Have I noticed any changes in the way people respond to me? Are the strategies I have been practicing getting easier to perform? These and other findings as well as more information on where to purchase Emotional Intelligence 2.0 here.